When indoor and alone with their babe, [Mary and Joseph] (the two) could talk again. Did not the strangers know that Joseph was just a poor carpenter? And that Mary was only the daughter of a village farmer? How could their baby ever be a King? 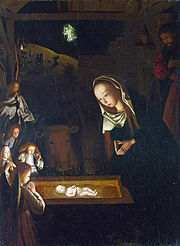 This, then, is the old, old wonder tale about the birth of Jesus. What really happened no one can now know. We do know, however, that this child of Mary and Joseph never became a King. Nor did he ever wish to be made a King. Jesus was a poor man by choice. When he was grown, he did not even have a home he could call his own. He was a teacher who traveled from town to town, teaching people how to live and what being good and doing right ought to mean. Most of those who lived in that long-ago time have been forgotten, but Jesus is still remembered. We all know the power of a newborn – yes, power. That might be a strange term to use for a helpless and vulnerable creature, but a baby just born is a wonder of nature, and that holds a power for many of us. Not only is it a powerful experience, but a magical moment in time when we wish the best for this new child of the universe: what will she grow up to be? Who will he look like? What a tremendous responsibility we, as parents and grandparents, realize is contained within that tiny form. "At Christmas it was the infant Christ who was born again in human hearts, and it struck Francis that God came to earth as a baby so that we would have someone to care for. Christmas was the dearest of feasts because it meant that God was now one of us. Flesh of our flesh and bone of our bone, this child we could approach without fear. We could be silly and uninhibited as we sought to make Him laugh. We could be totally ourselves because a child accepts us just as we are and screams with delight at our little performances on his behalf. It seems strange to think of God as a baby, but if you are a Christian and believe in the Trinity then it is not so far-fetched to think of the season of Advent as a time of preparing to welcome a baby God into the world. Except that the Puritans, one of the groups from which we trace our Christian heritage – were not terribly fond of the idea of celebrating the birth of the Christ child at this time of year. Did you know that during the time when Puritans ruled the English Parliament, they banned Christmas? It was replaced by a day of fasting, because the Purtians saw it as a pagan festival – and of course, they were correct about its December origins as the feast of Yule – and they called it a ‘popish’ festival that had no biblical basis. If anyone cooked meat for the Christmas feast they ran the risk of their home being raided and the meat confiscated by the Army! Ordinary Christians resented this kind of treatment, to the extent that it provoked riots in Kent. In both England and the American colonies the Puritans attempted to ban Christmas: here, celebrating Christmas could result in a fine levied against you. Christmas was still not widely celebrated by the time the Declaration of Independence was written, and in Scotland Christmas was only recognized as a legal holiday in 1967, thanks to the dropping of objections by the Church of Scotland. But for Unitarian Universalists today – even as we happily sing about Jesus Our Brother, Kind and Good – we may be feeling uncomfortable, not with the pagan origins of the mid-winter celebrations, but with the other Christological baggage that comes along with Christmas. The claim that Jesus was divine; the claim that he was sent to become, as an adult, a sacrifice for our sins; the claim that he is in heaven with God the Father. How do we reconcile the image of the lovely baby Jesus – as the Rev Keith Goheen calls him, “The Christ child, the star child of the Light, [who] calls forth the heart's wisdom through the power of innocence” – with the Savior/Messiah of the Gospels? Let me begin by saying that Christianity is one of the sources for our Unitarian Universalist faith; and if you were to be transported back a hundred years to sit in a very cold Unitarian church pew, say, in Boston, you might not recognize the Unitarianism as today’s with which you are familiar. For if there is one thing about our faith, as it has developed historically, it has evolved theologically – and our ideas about Jesus are no exception to that shift. What I will attempt to do this morning is to give a series of alternative perspectives on Jesus, not just from Unitarian Universalists, but from Judeo-Christian theology as well. who find the dogmatism of rigid orthodoxy to be unacceptable, and pure secularism to be unsatisfying; theirs is a low-keyed Christianity that focuses on the human life and ethical teachings of Jesus. They see doctrines such as the Trinity and the Atonement as unnecessary; the Bible, interpreted with reason and modern scholarship, provides the myths and symbols and stories that enable them to speak of God and to instill moral values. It sounds as if these UU Christians have tried to tiptoe their way through the 2000-year-old minefield of Christology! ‘Following’ Jesus – which Jesus? In answering that, we need to go back to the Unitarians in the 18th century on both sides of the Atlantic, who were at the forefront of a sea change in how Christianity was viewed. They played a big part in the Radical Reformation, and at this time were grappling with two issues to do with authority: dissent and the established church, and the role that reason plays in revealed religion. The development of liberal religion saw the rejection of the Athanasian creed, which Unitarians rejected because it was not true to Scripture or to reason. Then the divinity of Jesus became an issue in the early stages of liberal religion. An Irish Presbyterian minister named Thomas Emlyn produced an antitrinitarian argument that separated Jesus from God, based on evidence from Jesus’ own words in the New Testament. Emlyn argued that Jesus could not be God because Jesus appealed to a God other than himself, for example, when on the cross: “My God, my God, why have you forsaken me?” And when raising the dead, Jesus said he could do nothing on his own. Emlyn was arrested for his blasphemy, but he was the last dissenter to be imprisoned for denying the Trinity – the tide was turning. The next century saw the Unitarian rejection of Christian doctrine, seen as having deviated over the centuries from that of the original Gospels. 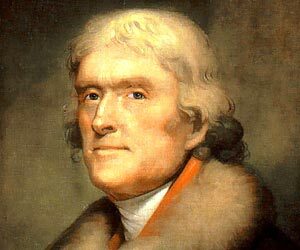 Thomas Jefferson – who, although admiring of Unitarians, never became one - wrote in 1822, “Had the doctrines of Jesus been preached always as pure as they came from his lips, the whole civilized world would now have been Christian.” (David Parke, The Epic of Unitarianism, Skinner 1957, 99) In fact, most of you will know that Jefferson compiled his own Bible, called “The Life and Morals of Jesus of Nazareth”. It leaves out any mention of the miracles surrounding the birth of Jesus – no angel Gabriel, no virgin birth, no angels or shepherds or Magi (37). Beacon Press published it as The Jefferson Bible in 1989; in his foreword, Forrest Church wrote that by Jefferson’s reading, it was Jesus’ “unusual life on earth that truly mattered” (viii). For one famous Unitarian author, the central ideas of 19th century Unitarianism were the basis of his work: “ the belief that Jesus was a human being who exemplified a truly religious life; the rejection of materialism and the rejection of a God of stern judgment; the rejection of dogma; an inclusive rather than an exclusive religion, and an emphasis on doing good works” (Michael Timko, “Ebenezer Scrooge’s Conversion, UU World, Winter 2005, 80). Remember! - It is christianity TO DO GOOD always - even to those who do evil to us. It is christianity to love our neighbour as ourself, and to do to all men as we would have them Do to us. It is Christianity to be gentle, merciful, and forgiving, and to keep those qualities quiet in our own hearts, and never make a boast of them, or of our prayers or of our love of God, but always to shew that we love Him by humbly trying to do right in everything. If we do this, and remember the life and lessons of Our Lord Jesus Christ, and try to act up to them, we may confidently hope that God will forgive us our sins and mistakes, and enable us to live and die in Peace. In the 19th century biblical scholarship became focused on digging into the origins of Gospel accounts of Jesus. It became clear to many scholars that Mark was the earliest Gospel to be written, and that Matthew and Luke were drawing upon a common source that became know as Q (from the German word for source, Quelle). There was a trend to strip away all additions to the story of Jesus and to get back to ‘primitive Christianity’. During the 1800s there were a number of Lives of Jesus – most by German authors, leading up to the publication in 1906 of one of the most famous, The Quest for the Historical Jesus, by Albert Schweitzer. In the US this trend influenced a Baptist minister, Walter Rauschenbusch, to publish The Social Principles of Jesus in 1916, which placed Jesus in the context of a social rights advocate who, if here today, would fight for workers and labor unions and even feminists. According to this perspective, the Golden Rule and the Sermon on the Mount served as the primary grounding for Jesus’ teachings. The historical trend of the twentieth century has, among other things, identified Jesus as a teacher; the focus for the biblical scholars in the 1950s was to find the original sayings of Jesus, and the Quest for the Historical Jesus movement attempted to separate these sayings from the myth built up around Jesus. In addition, redaction criticism became another focus for scholars, who explored how the authors of the Gospels interpreted Jesus through the theology of early Christian communities, such as the Greek and Jewish Christians. In the 1960s and 70s Jesus became for scholars a wandering charismatic who preached and healed, leaving his family and home and relying on support from the rural communities he visited. Liberation theology at that time suggested a picture of Jesus as rebel and liberator. The Jesus Seminar, begun by Robert Funk in 1985, is a series of meetings, with scholars who vote on the historicity of the Gospels after analysis using the latest in New Testament scholarship. The seminar’s conclusions point to Jesus being a ‘peasant sage’ who verifiably spoke only “90 out of the 1500-odd statements attributed to him by early Christian texts” (Charlotte Allen, The Human Christ, Lion, 1998, 276). The most well-known Jesus Seminar scholar, John Dominic Crossan, sees Jesus as an advocate of egalitarian, anti-patriarchal society, who breaks bread with social outcasts (279). Then we have the Dead Sea Scrolls discovered in the mid-20th century, which are providing a new line of scholarship, re-situating Jesus within a Jewish context and helping to correct anti-Semitism in some Christian teachings. Jesus from this perspective follows the pattern of Hebrew prophecy, in that he taught much that fits into a Jewish ethical framework but at the same time, his appeal to divine authority is in tension with some Jewish laws and even to some extent, the Torah. So which Jesus is laying in the manger for you? Did you ever think that it would be so complicated to consider the nature of this tiny child born in humble circumstances? Maybe the Jesus that Unitarian Universalists most identify with is none of the above…and instead, is very much like what most of us imagine each of us is, a non-conformist. Although as a congregation we are walking together in a common covenant, the influence of Ralph Waldo Emerson on our movement has made us UUs very proud to be individualistic, mold-breakers, not likely to follow along in any movement where we are herded like sheep. One of our most ardent social activist ministers from the 1950s, the Rev A. Powell Davies, wrote about the credo of the nonconformist – which sounds like a contradiction in terms! “he was a non-conformist--as he was bound to be, since he was a spiritual and ethical genius. He attacked prevailing views. He stated his own views clearly and emphatically. And the people who heard him recognized that they were hearing voices out of their own minds and memories. When he said that we should love and not hate, he said something that his hearers already recognized as a thought which they themselves had almost entertained. So with most else that he said. When he spoke, he was reinforced by insights that his hearers had rejected. The spiritual strength and moral courage of Jesus amid the temptation in the wilderness is our eternal challenge. Jesus was born at a time when the majority of people thought of the Kingdom as a political kingdom and thought of the Messiah as the one who would restore this political kingdom with all of his power and pomp and riches. And all of the temptations that Satan offered Christ were temptations to fall in line with this type of material political kingdom. In other words he was urging Christ to conform to wishes of the mob. But in the midst of such a plea we can hear Christ saying in no uncertain terms “Get thee behind me Satan.” As if to say, “I will not bow, for I have orders from an authority not of this world to build a new kind of kingdom, a kingdom that will one day rock the world, a kingdom that will shake the hinges from the gates of the Roman Empire. It will not be a kingdom political in structure and materialistic in outlook, it will be a kingdom of the spirit. I realize that at this time this type of kingdom does not conform to the majority opinion. But I will not bow. 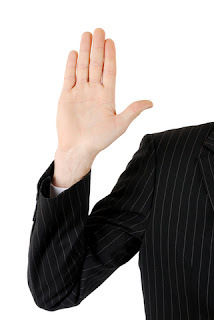 Who will take the attitude of Jesus and be a sincere nonconformist? Today we stand on the brink of moral and physical destruction and the great need of the hour is sincere nonconformists. Men who will stand amid a world of materialism and treat all men as brothers, men who will stand up in a world that attempts to solve its problems by war and declare that he who lives by the sword will die by the sword. We know that Jesus paid for his non-conformity with his life…so did Dr King, and so do people still all across this planet who are searching for freedom and justice. If this is the Jesus we find in the crib, a Jesus who speaks out for truth, for peace, for justice, for love, then we welcome him gladly this Christmas morning. Warning! There are a lot of people – mainly conservative Christians – intent on ‘taking back’ Christmas. The assault on the phrase ‘happy holidays’ has been one part of this campaign – remember how we’re told that Merry Christmas is the correct greeting. Another part that began a couple of years ago was when one holiday décor company began advertising the CHRISTmas tree – an artificial Christmas tree with a giant cross where the trunk should be. Now some of us may know that the cross did not become the dominant symbol of Christianity until about the 9th century – so the CHRISTmas tree is an interesting mix: the Christmas tree is a nice, happy symbol of decorating and gift giving – the ultimate gift of a baby being born and the star of Bethlehem and angels singing. The cross is a grim reminder of that baby’s eventual end as a betrayed prophet. What is it that rings your bell about Christmas? Is it a bell of joy or of alarm? Do you feel an increasing dread about this time of year because you realize the enormity of gearing up for a pre-Christmas marathon of shopping, cooking, cleaning, decorating? Well this morning’s sermon is inspired by a book called ‘Unplug the Christmas Machine’, written by Jo Robinson and Jean Coppock Staeheli back in 1982 and revised in 1991. If anything, the power of the Christmas machine has increased since then; there are more commercial messages that appear “as promises that bring tears to our eyes” (10). 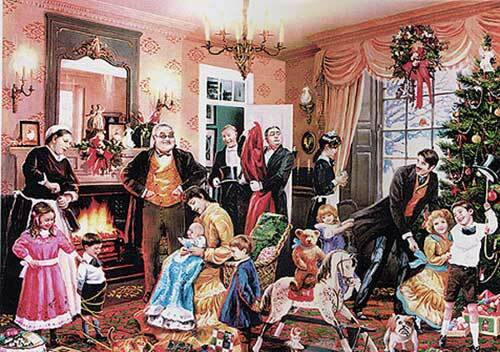 In the early 20th century Christmas shopping became increasingly important when companies began the manufacture of Christmas ornaments, lights and Christmas cards, and correspondingly stores and shops began to hire extra employees during the season to handle the increased sales. This year’s holiday spending is estimated to rise slightly from last year by about 3%, according to a Gallup survey of November spending – each of us expects to spend $764 for gifts (www.advisorperspectives.com/dshort/commentaries/Gallup-Holiday-Spending-Survey-111116.php ). 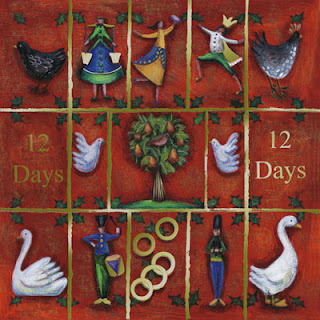 And now we’re to the point – as you might have seen reported this week – that it would cost us over 101 thousand dollars to buy everything mentioned in the song ‘The Twelve Days of Christmas’! The price hike from last year’s cost of $97 thousand is mainly due to the sky-high cost of the partridges and the turtle doves, both of which have seen double-digit price hikes in the past year. There is a serious point to this – a fraction of the money Americans spend in stores just in the month of December would supply the entire world with clean water. This figure comes from Rick McKinley, a pastor from Oregon, who is one of the leaders of the Advent Conspiracy, a movement that has 1500 member churches and organizations, as well as over 45,000 fans on Facebook. The Advent Conspiracy offers an alternative to how Christians spend their Christmas shopping money – they are urged to spend, but by giving donations to organizations such as Living Water International, which digs wells in developing countries. Well if we are really uncomfortable, we might cast our lot not with the conservative Christians but with the social activists who came up with “Buy Nothing Day,” which this year was November 25/26 – Black Friday and Saturday. The first “Buy Nothing Day” came in 1992 in Vancouver Canada, created by the anticonsumerist magazine Adbusters, to help people reflect upon the issue of over-consumption. Last summer, the longtime editor of Adbusters, Kalle Lasn, felt that the Arab spring uprising and the convulsions felt by some of the world economies might herald an opportunity to tap into the frustration simmering in the circles of the American political left. So building on the smaller “Buy Nothing Day” campaign, he decided to create and brand a larger campaign. On July 13, he and his colleagues created a new hash tag on Twitter: #OCCUPYWALLSTREET. The whirl-mart, where participants push their shopping carts around in a silent conga line without putting anything in the carts. Or should we consider over-consumption to be accepted as just human nature? To quote Rebecca Parker, ‘Economically, the dominant worldview regards human beings as self-interested individuals, motivated only by their personal desire to consume” (Blessing the World, 147). Recent research into Christmas shopping has uncovered an affinity that some shoppers have with fairy tales. They “seriously enjoy Christmas gift shopping” because they see the activity as a consumer fairy tale “in which consumers employ magical agents, donors and helpers to overcome villains and obstacles as they seek out goods and services in their quest for happy endings”. ‘Triumph over hardship’ is a major theme of fairy tales, and so the challenge of having the perfect Christmas involves some of the same types of struggles and sacrifices as can be seen in Jack and the Beanstalk or Hansel and Gretel (http://news.illinois.edu/news/03/1211xmas.html). Researchers from the University of Illinois and the University of Texas tracked four women for 7 years as they did their Christmas shopping, and then interviewed them about their “Christmas lives”. They found that the women were not content to have a ‘tolerable’ Christmas, but instead tried to outdo themselves each year, to create a more memorable Christmas than the previous year – a ‘fairy tale Christmas’. This term to them meant a Christmas in which they seek ‘happy endings for their celebrations, like those fairy tales that end with a joyous family reunion, the acquisition of precious goods, or recognition for creativity and cleverness’ (http://news.illinois.edu/news/03/1211xmas.html). Using the terminology of fairy tales, these shoppers, who could be cast as ‘heroines’ in their shopping experiences, had ‘helpers’ like Santa, (typically their mothers). And sometimes the ‘villains’, who interfered in different ways with the heroines’ ‘quest’ for harmonious family celebrations, were their fathers. The key to this study seems to be what makes these shoppers happy: Ezra Klein, writing in The Prospect about Christmas consumerism, says that when he reflects at Thanksgiving on what he is thankful for, “no matter how much cool stuff I purchase…all I remember…are people” (www.prospect.org/cs/articles?article=winning_the_rat_race_by_quitting_it). He goes on to quote an economist at the London School of Economics, Richard Layard, who is a professor in the emerging field of ‘happiness studies’ and is the author of Happiness: Lessons from a New Science (Penguin, 2005). Professor Layard says, “Family, colleagues, community – we are basically social animals, and most of our enjoyment comes from other people”. The Christmas Machine has this power over us because it knows how to woo us; it speaks to the deepest, profoundest, and most sacred desires of the human heart. If it appeared as a monster, we would rise up and stop it. But the commercial messages of Christmas appear as promises that bring tears to our eyes. Look at the bounty we are promised by the December magazines and the glowing Christmas commercials: Our families will be together and happy...Our children will be well-behaved and grateful...Our wives will be beautiful and nurturing...Our husbands will be kind, generous, and appreciative...We will have enough money...We will have enough time...We will have fun...We will be warm...We will be safe...We will be truly loved. The working mother who lives day in and day out with the nagging feeling that she should be doing more for her children is an easy target. When she sees an ad that tells her she can ensure her daughter’s happy memories by buying a hundred-dollar doll, she is extraordinarily open to the suggestion. Some of these seem to be tongue-in-cheek, but most of us recognize how these rules can complicate our lives. It can make for an awkward social situation if we don’t play by these rules! When we begin to examine what motivates us in our efforts to create the fairy tale Christmas, we can quickly see that unplugging our Christmas machine needs, as Baldrick, in the British comedy Blackadder, says, ‘a cunning plan’. The key to unplugging the machine is knowing what you REALLY want, according to Robinson and Staeheli. Do we want to change some of the ways we celebrate Christmas and, in particular, some of the ways we are driven to behave when buying gifts? Unplug the Christmas Machine suggests that we take four steps toward making any change to our upcoming Christmas celebration. First, we realize that any plan we make will not be our only instrument of change; we shouldn’t feel that it is set in stone, because there may be other changes that are spontaneous, and any moment-by-moment decisions may well add to your enjoyment of the celebration. Second, set small and specific goals. We can’t change everything at once and people need time to adjust to new ideas. Our traditions and rituals are important, and they play a special role in our lives, which are subject these days to a great deal of change and uncertainty; most people don’t want to completely transform the way they celebrate Christmas; they may only want to clear away a few things that have lost their meaning or look at how they can add more depth and meaning to established rituals (132). Third, planning takes time, and if you start in mid-summer you can plan some fairly detailed changes and talk to all family members about them. If however you start on the 4th of December, you need to keep your focus on changes that can be put into action at the last minute, like adding a family walk the day after Christmas to help everyone wind down from the excitement of Christmas Day. Fourth, you’ll have a good chance of success if you either focus on a goal that you can accomplish independently, or on one that has the likely support of everyone. Robinson and Staeheli give this example: …if you are bothered by a relative’s excessive drinking you will probably be frustrated if you define your goal this way: “I would like to encourage my father to drink less this Christmas”. A more realistic goal statement is: “I would like to add activities to our celebration that would take the emphasis off drinking”. This second goal would be more achievable for you to accomplish even without your father’s cooperation. (132) Your goals need to be realistic, have support from those people who are involved, and you should still be able to enjoy all those parts of your Christmas celebration that still have strong emotional appeal to you and others (133). How are you going to reach goals like these? Look at your goals and think of one or two activities that will help you achieve them: what are you going to do and when should it be done? For example, if you want to simplify gift-giving, then you might contact the other family members who are usually present for gift-giving in plenty of time for changing the pattern, asking them to agree to only give gifts to the children at the upcoming Christmas celebration. If you want to spend more relaxed time with your children – big or small – think of activities you and others have enjoyed in past holiday seasons: card playing, game playing, singing, reading aloud to each other, attending concerts, winter sports, telling stories about the family, cooking together, going for walks. Which of these would you like to do this year? Many of us realize that we often neglect many of our favorite activities at Christmas. Adding just one enjoyable tradition is sometimes all it takes to have a more rewarding celebration (96). The Christmas Pledge asks us to commit ourselves to remembering those who are in real need of gifts; the efforts of the Advent Conspiracy, which I mentioned earlier, aim to do just this, asking people to spend their money on water projects in developing countries. The pledge asks us to commit ourselves to express our love in more direct ways than gifts – the Beatles sure had it right when they sang, ‘Money can’t buy me love’! The pledge asks us to commit ourselves to examine our holiday activities in the light of our deepest values: we can begin to do this when we come up with a plan to make our celebrations more meaningful to ourselves and to those we love. The pledge asks us to be peacemakers among our family and friends – we can begin to do this when we disregard the often problematic social code of gift-giving; we can spare ourselves and others distress, embarrassment, resentment and conflict. The holiday season is also a time in many faith traditions of light in the midst of darkness – as with Hanukah and Solstice, and we have a ‘Blue Christmas’ service coming up on the 19th that will explore that theme further. In closing, the Christmas pledge asks us to believe in the true spirit of Christmas – and as we sing in the Advent hymn “O Come O Come Emmanuel,” this will be with us when love, truth, light and hope come to dwell. These are the gifts of Christmas that matter most, and in the words of Richard S Gilbert: “Gifts that matter have no weight” (Rejoice Together, 81). Blessed be, Amen, May it be so.